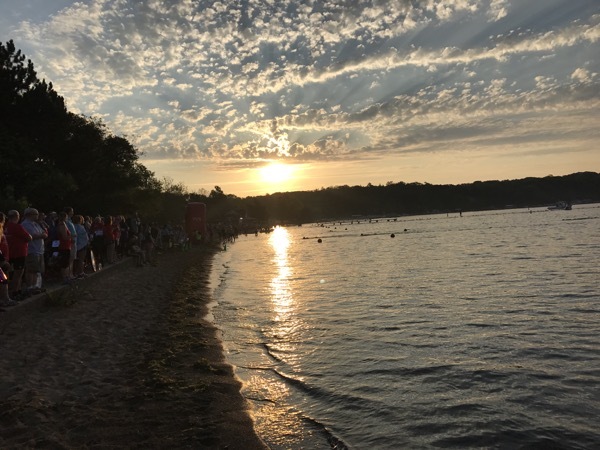 This weekend was the third race for me over the past four weekends in Lake Geneva as part of the Escape Series Triathlon. 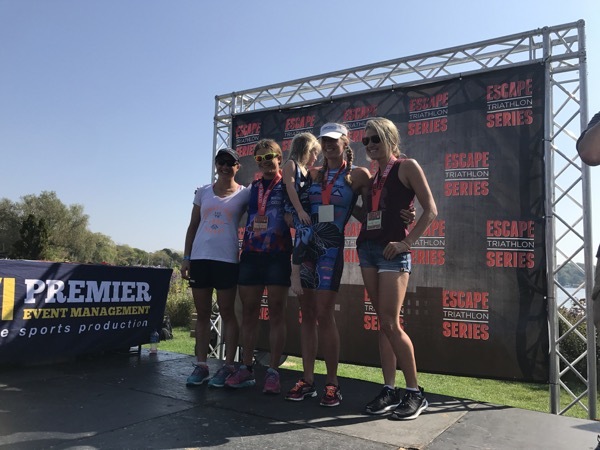 There was one final race scheduled for next weekend in New Orleans, but this race was cancelled a few weeks ago, so this was the final race for the Escape Series this year. 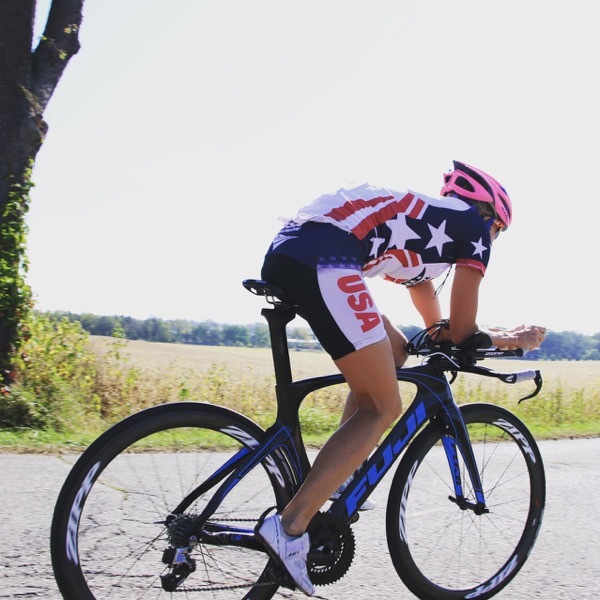 This month has been a whirlwind with the travel, but it has been a great feeling to get back into some racing and test my fitness at four months postpartum. A couple of weeks prior to the race, Connor started waking up earlier and earlier and then began to wake up several times a night. Fatigue from the races and from interrupted sleep was beginning to take it’s toll and I was a little worried if my body would hold up over the course of the month! On day in particular that was tough was a few days after the DC race, I had put in a four hour training day and then only managed a couple hours of sleep the following night. I woke up with my head spinning, unsure how to get through the day and I have not felt that much fatigue in a long, long time. I typically try not to let my kids know how tired I am and always put on my game face for them, but I was especially tired that morning and just started to cry. My daughter was so sweet and said, “Mommy, why are you crying.” I told her, “Honey, Mommy is just really tired, but, I am ok.” She said, “Mommy, I know what will make you feel better. I will get you some coffee.” Ahh, innocent childhood sweetness made me smile! I don’t drink coffee (have never liked the taste), but I am sure she has overheard her Daddy say many times how much better coffee makes him feel…LOL! The next night was a little better for sleep and a fitting a nap in (if possible) can make a world of difference. With all the races this month, I really didn’t do too much training. Mostly just some sharpening between races and kept the body moving. Since Wisconsin was a five and a half hour drive, the whole family came along and we managed the trip in eight hours with stops. We also stayed at an indoor water park, so the kids could really enjoy the race as well. The weather was very warm for late September with temperatures in the 90s, so swimming was something on everyone’s mind. The race began at 7:00AM and the women were scheduled to start 2 minutes after the men, but we started just 30 seconds behind. I felt a bit sluggish in the water, but managed to exit in first. 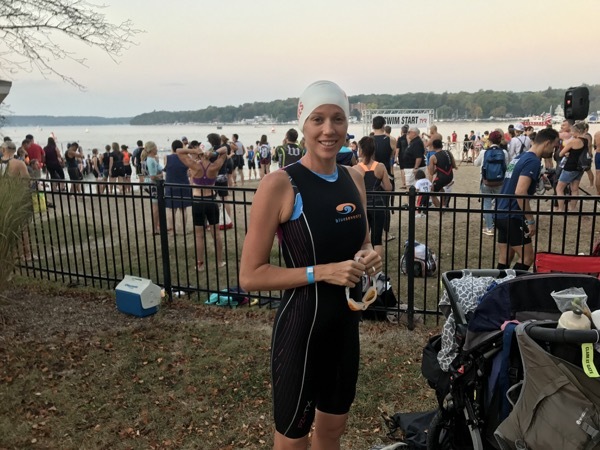 I decided to stop to put shoes on for the T1 so I did not have to run barefoot on paver stones and as a result lost about 15-20 seconds to Lauren getting on my bike. Once I got on the bike, it took about 7-8 miles for my legs to really get going. Around mile 12-13, I made a pass on Lauren and regained the lead. The course was rolling and a bit rough in spots. I focused on staying clear of the potholes and having smooth turns. Unfortunately around mile 16, I had an unfortunate incident on the bike. As I was making a right hand turn, a wide utility truck was waved by the officials to turn directly in front of me (we were riding on an open course for traffic). I had to slam on my brakes and then decide if I could get around the vehicle. I was biking back on forth deciding if it would be safe to pass and at first I knew that it would be too dangerous since the truck was so wide and there was not a shoulder. I ended up sitting up and spinning and not sure what to do. I looked back at the official at one point, shrugging my shoulders and putting a hand up as to see if they could let me know what to do? Towards the end of the road, I saw a small shoulder open up and I rode up to the vehicle to see if I could pass on the shoulder. I was very frustrated that this vehicle was slowing me down during my race. My race mentality is to always be pushing and to be going hard! I was debating whether or not it would be safe to pass the vehicle and decided I did not want to risk it when the official came by me and told me to stand down. I was a bit in shock but immediately stood down. The official told me that I needed to be farther away from the vehicle (much farther than a bike since it was a vehicle) and I was too close. She said that the vehicle should have never been allowed to pull out in front of me, but since it was there I needed to drop back 20 meters and go slower than my previous pace. She said she would normally ride up next to the vehicle and order it to get off the road, but she could not do that due to the fact there was not any room. This was my first penalty in 13 years of racing and it was a bummer for this to happen and definitely knocked me out of my groove. I don’t think I have ever raced on an open course, so I guess I did not have the rules established. I obviously was not trying to “draft” off the car since it was going slower than my previous pace, I was only thinking how I could get around it. I will be better prepared for this situation if it ever happens again! Hopefully my first and last penalty. I got off the run and told Nate what happened and started with a mindset of “finishing” the 10k and finishing strong. The run was very hilly at the start, with short, steep pitches. At the halfway mark I was maybe just a little over a minute behind Lauren and this gave me a little motivation to run faster; however, the gap was too much and I cruised onto second place. 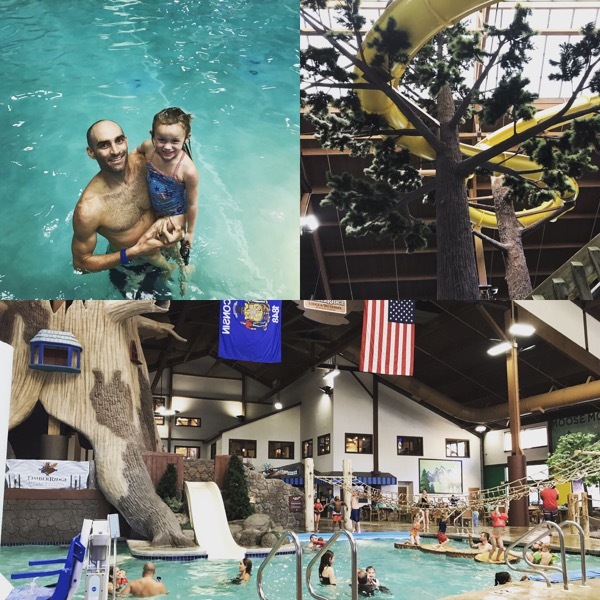 Post race, the family enjoyed a pancake and egg breakfast and we spent the afternoon at the hotel waterpark. All and all I can’t complain about my performance the past few weeks. Looking back there were days I didn’t know if it would be possible to compete! These last few races give me confidence about my fitness for next year and seeing what my body can do after I have a proper base training and race build up. 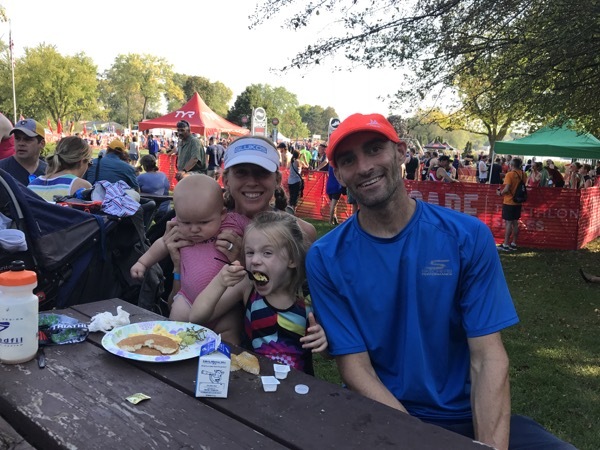 My training and racing would not be possible without all the help from my family, so I can’t thank them enough for the support.